A simple activity to get students moving is to have them walk around their desks and talk. 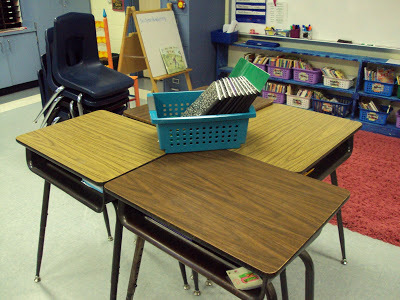 This sounds overly simple, but it actually works well as long as you have practiced routines regarding how to move in the classroom I have my desks arranged in groups of three. I know that I probably send this in a previous post, but I always have my students sit in groups of three during a regular lesson. Somewhere I read, or was told, that three was the magic number, and now that I have arranged them in this way for years, I tend to believe it so. Anyway, to do this activity, I pose a question to students they either have to think about or respond to in their writer’s notebooks. After a few minutes of “power” thinking, I ask that students stand and push their chairs in. Students are then told to decide who is 1, 2, and 3. I pick a number and students will speak in that order. For example, I could pick 2 and the order would be 2, 3, and then 1. All student then walk clockwise around the desk grouping they are next to. As they walk, they talk. This basically takes a brief group discussion and makes it a group walking discussion.